A luxury train in India is a culmination of heritage, history, traditions and hospitality of the land. These special tourist trains take a traveller through the different amazing routes to royalty in the most magnificent way. The journey of a Luxury Train in modern India began in the year 1983 with the launch of the Palace on Wheels, the first royal rail service aiming to promote luxury tourism in Rajasthan. This train was conceptualized on the royal historical background of the coaches, which originally served as the personal railway saloons of the princely rulers of Rajputana, Gujarat, Hyderabad and the Viceroy of British India. Presently, this is the only luxury train upholding the legacy of the princely era in modern times. The coaches of the train recently received a refurbishment in terms of featured décor and services. The train tour completely concentrates on a weeklong trip through royal attractions of Rajasthan. Over the thirty years of its successful operation, the train got awarded with the PATA Gold Award in the year 1987 and is also counted among the top four Luxury Trains in the World. 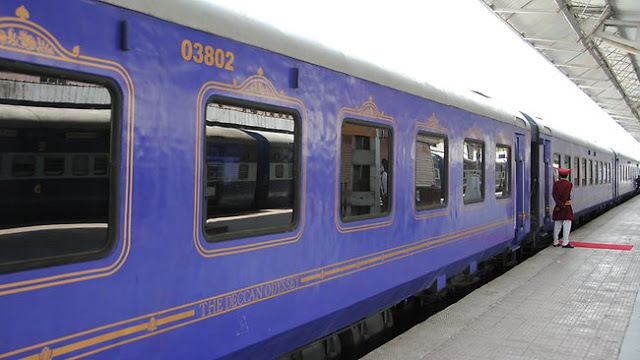 The launch of the Palace on Wheels luxury train and its soaring popularity all over the world inspired the other Indian states to begin their own luxury train tours based on their nature, culture and historical heritage. The second luxury train, the Deccan Odyssey offers the luxurious interpretation of the state’s Maratha royalty and trails around the Konkan route. The train starts in Mumbai and travels to Sindhudurg, Goa, Belgaum, Kolhapur, Pune, Nashik, Aurangabad and Ajanta-Ellora before reaching a hearty conclusion. The hospitality of the train is managed by the Taj Group of Hotels, which is another exclusive facet of this luxurious joyride. The third luxury train, the Golden Chariot Train is the glorious take of Karnataka’s heritage etched royalty. To sum up the distant royalty of the rich Karnataka, the magenta laced train trails through two routes. Pride of South, the first itinerary begins its heritage trail in Karnataka and ends in the soothing solace of Goan beaches. The Southern Splendour train on the other hand begins its trail from Karnataka to Tamil Nadu and ends in God’s own country, Kerala. The Royal Rajasthan on Wheels, the fourth luxury train is another heritage laden trail exploring the cultural side of India in the modernistic way. From Rajasthan, the train takes a route to the temples in Khajuraho, spiritual side of Varanasi and amorous interpretation of Agra’s Taj Mahal in its glorious route. The fifth luxury train is the grandest among all. It is undoubtedly the King of all luxury trains in India. May be that’s why the train is named as Maharajas Express. This train trails around five different routes in the most magnificent and sumptuous way. The train itineraries are the heritage of India, the Indian splendour, Panorama of India, Gems of India and Treasures of India. In the following blog posts, we will elaborate the itineraries under the Maharajas Express luxury train in detail.